Libby Stanford wanted to challenge herself. The high school senior from Lawrence, Kansas was in class when her teacher suggested doing something every day for 100 consecutive days. Libby chose to write stories and share them. Every day. For 100 days. The resulting blog showed Libby's range of writing styles and interests — humor, mystery, science fiction, even journalism. 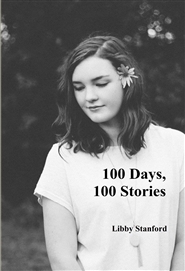 "100 Days, 100 Stories" is Libby's resulting short story collection. An enjoyable read from a talented teen writer.